This guide will take you through Conductor Widget AJAX requests which utilize the Conductor REST API. As of Conductor version 1.5.0, Conductor Widgets support AJAX requests for querying content. Conductor Widget AJAX requests utilize the Conductor REST API. How Do Conductor Widget AJAX Requests Work? 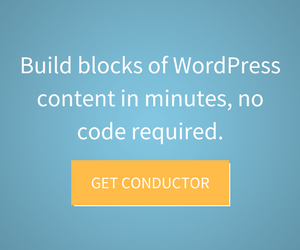 Conductor first determines if the Conductor Widget has AJAX enabled. If AJAX is enabled on the Conductor Widget, event listeners are added to various Conductor Widget elements (i.e. pagination links). When one of these elements is interacted with (i.e. clicked), a Conductor Widget AJAX request is created. As of version 1.5.0, Conductor Widgets use the POST request method when making requests to the Conductor REST API. Some Conductor add-ons may add their own extra data to pass along with the AJAX request. See Filtering Add-On or Query Builder Add-On.